The biologics market is expected to grow at an impressive pace during the forecast period. The gains will be driven by substantial investments in research and developmental activities in the biotechnology and pharmaceutical sector and the soaring demand for novel therapies for various rare diseases. Recent intensive researches in novel therapies and combination therapies have established the efficacy of biologics for treating a wide range of chronic diseases such as cancer, rheumatoid arthritis, macular degeneration, and hematological malignancies. The introduction of recombinant DNA technology has expanded the potential of the biologics market. The emergence of promising drug candidates has made several global and regional pharmaceutical players venture into the biologics market. The increasing rate of approval of biologics by various regulatory agencies such as the US Food and Drug Administration (FDA) and European Medicines Agency (EMA) has positively impacted the market. The global biologics market is forecast to expand at a CAGR of 10.9% over the period 2016 – 2024. Maintaining a steady pace of growth, the market is anticipated to attain a valuation of US$479, 752 mn by the end of the forecast period. Several players are making large investments in expanding their biologics facilities across major geographic regions to gain a stronghold in this market. Leading players are launching novel therapies approved by the FDA to gain a competitive edge over others. The top biotechnology and pharmaceutical companies are forging partnerships to consolidate their shares across various regions. On the basis of geography, the global biologics market is segmented into Europe, North America, Latin America, the Middle East and Africa, and Asia Pacific. Of these, currently, North America leads the global biologics market and is anticipated to occupy a revenue share of over 40% by the end of 2024. The growth in this regional market is attributed to intensive R&D activities, innovative drug formulations, and a large number of clinical trials focused on large-molecule drug discovery. In addition, the promise of profitable returns due to the premium pricing of biologics will stimulate investment in the coming years. However, owing to a wide patient base in need of novel therapies for chronic diseases and low cost involved in drug manufacturing, Asia Pacific has been brought to the forefront. The spiraling growth of the regional market is anticipated to outpace Europe as the second most prominent market for biologics. The Asia Pacific market is poised to expand at a tremendous CAGR of 15.6% during 2016–2024. Rise in favorable regulations for the approval of biologics has triggered the growth of the regional market. In addition, the influx of global pharmaceutical companies setting up their biologics production facilities in emerging markets, particularly China, is expected to propel the regional market. On the basis of product type the global biologics market is segmented into monoclonal antibodies, vaccines, cell therapy, gene therapy, and recombinant hormones/vaccines. Amongst these, the monoclonal antibodies segment is expected to lead the market along the forecast period. The extensive growth is attributed to the increasing demand for personalized therapies in various regions. Furthermore, extensive researches in antibodies to discover targeted therapies for a variety of diseases, such as different types of cancers, infections, and various immunological disorders, are expected to propel the market. For instance, various researchers are studying the potential of monoclonal antibodies responsible for destroying cancer cells and cloning them so that they can be used for other patients to trigger positive immune responses. This segment is anticipated to rise at a CAGR of 11.9% during 2016–2024. The market for vaccines and recombinant hormones/proteins is anticipated to register significant growth over the forecast period. However, competitive pricing of many vaccines and the large-scale expiry of biologic patents are likely to hinder the regional market. This segment is expected to witness an incremental rise in the global shares by the end of forecast period, driven by robust sales across developed and emerging markets. The global biologics market is fairly fragmented with the presence of numerous global companies and several regional players. Few of the leading players in this market are AbbVie Inc., AstraZeneca, Amgen Inc., F. Hoffmann-La Roche Ltd, Bayer AG, Sanofi, Eli Lilly and Company, GlaxoSmithKline Plc., Pfizer Inc., Merck & Co., Inc., and Novartis AG. This report provides forecast and analysis of the global biologics market on the global and regional levels. It provides historical data of 2015 along with forecast from 2016 to 2024 in terms of revenue (US$ Mn). The report also includes macroeconomic indicators along with an outlook for biologics revenue annually. It includes drivers and restraints of the global biologics market and their impact on each region during the forecast period. The report also comprises the study of applications and opportunities for biologics manufacturers. It also includes a detailed analysis by product type and supply chain analysis with a list of suppliers and industry stakeholders at each node in the supply chain. In order to provide users of this report with a comprehensive view of the market, we have included detailed competitiveness analysis, key blockbuster products, clinical pipeline analysis and company players with unique propositions. The dashboard provides a comprehensive comparison of biologics manufacturers on parameters such as revenue sales, ranking of global players, strategic consolidations, i.e. mergers & acquisitions, licensing activities, as well as R&D activities. The study encompasses market attractiveness analysis, product type, application type, and region. The report includes the revenue generated from sales of biologics in all regions and important countries in these regions. By product, the global biologics market has been segmented into monoclonal antibodies, vaccines, recombinant hormones/vaccines, cell therapy, gene therapy and other products. By application type, the market is segmented into oncology, infectious diseases, immunology, auto-immune diseases, and other diseases. Furthermore, the global market is sub-segmented into North America, Europe, Asia-Pacific, Latin America and Middle East & Africa. Market numbers have been estimated based on the annual global and regional sales of key companies; annual production and the revenue of local players is derived from regional pricing trends. Market size and forecast for each segment have been provided in the context of global and regional markets. 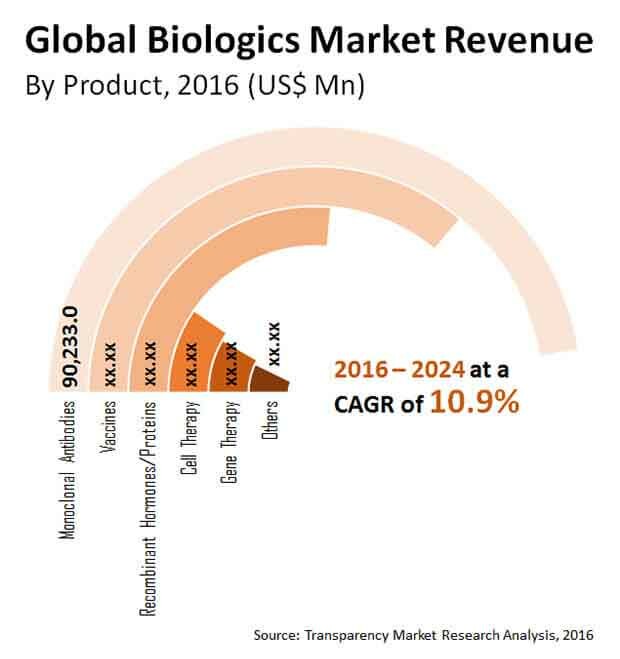 The global biologics market has been analyzed based on expected demand. Prices considered for the calculation of revenue are regional average prices obtained through primary quotes from numerous regional biologics manufacturers, suppliers, and distributors. All key end users have been considered, and potential applications have been estimated on the basis of secondary sources and feedback from primary respondents. Regional demand patterns have been taken into consideration while assessing the market for various products manufactured in different regions. Top-down approach has been used to estimate the biologics market by regions. Market numbers for global product type and application segments have been derived using the bottom-up approach, which is cumulative of each region’s demand. The company-level market share has been calculated on the basis of revenues reported by key manufacturers. The market has been forecast based on constant currency rates. Several primary and secondary sources were consulted during the course of the study. Secondary sources include Factiva, World Bank, FDA, NCBI, Springer Journals, Google Books, Society Publications, Biotechnology Innovation Organization, Arthritis Foundation, British Society for Rheumatology and Hoover’s, as well as company annual reports and publications. The report provides detailed competitive and company profiles of key participants operating in the global market. Key players in the global biologics market include AbbVie Inc., Amgen Inc, AstraZeneca, Bayer AG, Eli Lilly and Company, F. Hoffmann-La Roche Ltd, GlaxoSmithKline Plc., Johnson & Johnson Services, Inc., Merck & Co., Inc., Novartis AG, Pfizer Inc., and Sanofi.